As I wander among the West Philly High School students milling about a noisy garage a few blocks from their school, I can't help thinking, "MIT must be sick of these kids." MIT, of course, is the Massachusetts Institute of Technology, the country's august science, technology and engineering university. Its alums have scored Nobel Prizes, founded companies like Intel and headed prestigious schools like Harvard and Johns Hopkins. West Philadelphia High, as we all know, is a school dealing with every scourge of the inner city. The fallout of poverty, crime and family dysfunction play out daily in its ancient, neglected halls at 47th and Walnut, challenging teachers to keep good kids above the fray and wayward kids from causing it. If you learned that MIT and West Philly had entered a $10 million, international contest to produce a car that gets 100 mpg, which school would you expect to make it through the first qualifying round of the competition? "Yeah, we beat out MIT," smiles West Philly junior Daniel Moore as he shows me the Harley Davidson 1340 motorcycle engine that he and fellow students are retrofitting for one of two cars they're building in the school's garage on Hanson Street. "We brag about that a little. But we still want to win the big prize. We want to design the cars of the future." You know that movie "Stand and Deliver"? About the struggling Los Angeles high-school kids who mastered calculus, inspired by teacher Jaime Escalante's belief that they were capable of the rigorous study that the difficult math required? At West Philly, Simon Hauger, Ron Preiss, Jerry DiLossi and Ann Cohen are the same kind of teachers, and their students the same kind of kids. Eleven years ago, Hauger, 40, was a math and science instructor, fresh out of Drexel, who believed that the best way for kids to learn was to sit in rows, in a classroom, taking notes. After four years, he believed, they'd do best to partake in additional college academics, after which they'd get good jobs. "I learned pretty fast that not all kids learn the same, and that college isn't for everybody," says Hauger. He was humbled to discover that some West Philly grads who'd gone through the school's Academy of Automotive and Mechanical Engineering (the only certified auto academy offered by a Philly public school) were earning more with their certificates than he was with his fancy-pants Drexel degree. Hoping to engage the kids who were zoning out at their desks, he started an after-school automotive club in which they could put their math and science classwork to use in the garage. From the get-go, he urged the teens -a dozen-plus boys and girls, freshmen to seniors - to think big. For the school district's annual science fair, he had them build their own car, cobbled together using donated equipment, scavenged body parts and unique doodads that the kids created on their own. The students won the contest. The car they created for the next year's fair took top prize, too. Inspired, they created a car that won first place, in 2002, in the national Tour de Sol, a contest in which competitors develop alternative-fuel vehicles. That's when they first bested MIT. In 2005, West Philly snagged the award again, cheering crazily as New York's then-Gov. George Pataki handed them the trophy in Albany. "That was wild," says Hauger, recalling how the team blew out the car's custom axle during a practice run the day before the contest and scrambled to rebuild it. "We worked on it all night." After their win, as national accolades poured in, Hauger realized that something had changed in how he regarded this little club he'd put together to give kids something meaningful to do after school. "I'd always told them that we could do whatever we put our minds to, but that's something that adults tell kids all the time," says Hauger, a father of three. "You want them to believe in themselves, even though you know that not everyone is going to be a superstar." After the second Tour de Sol, though, it dawned on Hauger that maybe the West Philly club members really could do whatever they put their minds to. It was no longer a clichéd statement of encouragement. Eighteen months ago, Hauger set his students' eyes on what ought to be an absurd competition for a small, underfunded high-school club to enter: the $10 million Progressive Insurance Automotive X PRIZE. 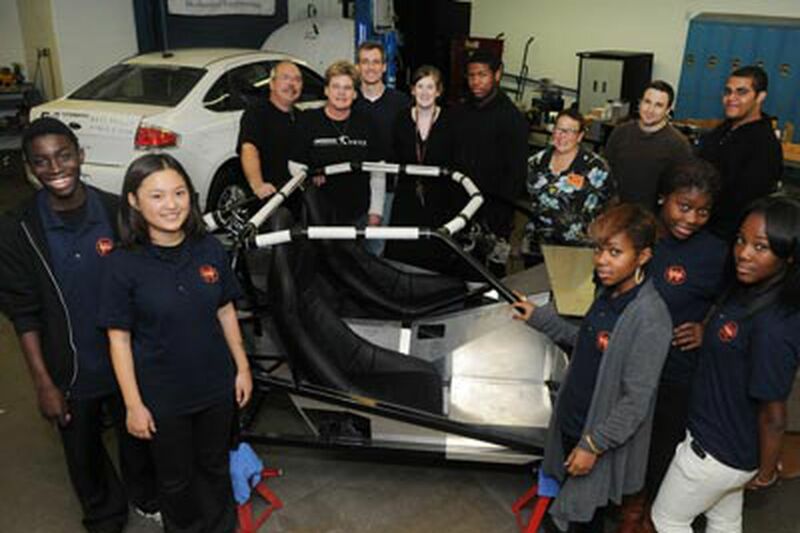 The competition requires entrants to create an affordable car that gets 100 mpg and can be mass-produced. They must also submit a business plan detailing where and how the car will be produced and how it will be marketed for sale. The contest will award $5 million for the best four-door economy car. Two prizes of $2.5 million each will go to top winners in a two-seater category. West Philly submitted applications in both classes. Of the 111 international contest entrants, 21 dropped out. The remaining 90 submitted plans to X PRIZE judges early this year. Last month, the West Philly team was among only 43 given the green-light to remain in the contest. Their competition includes teams from Cornell University, Tesla Motors and Tata Motors, to name a few heavyweights with access to massive resources and funding. MIT - ahem - did not make the cut. "West Philly is the only high school in the competition," says X PRIZE spokeswoman Carrie Fox. "We're very excited to have them on board." And lest we think that West Philly made it through on sentimental favoritism and not merit, think again, says Steve Wesoloski, a member of the X PRIZE technical team that reviewed the school's submission. "The West Philly team was very thorough in the plan they presented for review," he says. "Their level of detail and professionalism proved to us that they deserved to move forward in the competition." The kids must now build their car, finalize their business plan and submit their application by next spring for testing and evaluation over the summer. Winners will be announced next October, but editors at Popular Mechanics, which evaluated the finalists' proposals, have already pegged West Philly among the top-10 contestants likely to win. "We're definitely being taken seriously," says Hauger. But they need money to stay in the game. West Philly has already raised $300,000 via grants from the state Department of Environmental Protection and the Philadelphia Academies, as well as smaller cash contributions and in-kind service donations from a number of supporters, including Drexel University, which is helping develop the business plan. But the team is still $80,000 to $100,000 short of what's needed to knock their application out of the park. "The blood banks have already told us we can't sell any more of our blood" to raise money, Hauger says - and it's not clear whether he's joking. I'd give the kids my entire bank account, if I could. As student Azeem Hill told me this week, "People talk about school-reform strategies in Philly. Our car club is a reform strategy." http://go.philly.com/polaneczky. Read Ronnie's blog at http://go.philly.com/ ronnieblog.